Knowing how to get more reviews for your Google My Business page is important for so many reasons. I won’t list them all but it helps your GMB pages’ rankings. And it helps people get an idea of what doing business with you is like. Since Google changed their GMB search rankings a few weeks back, I’ve noticed many of the businesses in the top 3 have 20+ reviews. I still get clients asking me for ways to get more reviews. I’ve talked about a few ways already. Today I’ll go cover another way to get more reviews. Another way is to have a sheet at your front desk asking clients to review your business on Google. We’ve done this for all our clients who have a storefront and it’s worked great. The best news is it’s really simple to set in place. Create a introduction sheet which you can post at the front desk of your storefront. If you service clients at their location, you can mention to them that if they have a Gmail account, it would be greatly appreciated if they could write you a Google review. 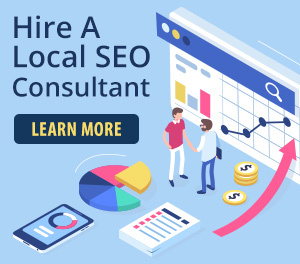 State that reviews are important for your local search rankings and that potential clients will find them useful in whether they will choose your business. Once again you can post this at your front desk or checkout area. The next step is to create step by step instructions on how to write reviews. If your clients aren’t tech savvy, it’s important to make things really easy. Here is an example of what our introduction and instruction sheet at Meaningful Marketing looks like. All you need to do is change the business name and create screenshots so you can replace our images with yours. For those business who service clients at locations, simply print out the instructions and hand it to them. This would work well for any contractors. If you want to turbo charge your reviews, implement the strategy below with caution. 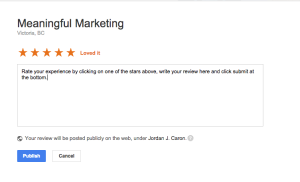 I originally listed the idea of creating a draw with those who wrote you a review on your GMB page. After looking through Google’s GMB review guidelines for a second time, I didn’t see where it clearly says this is not allowed. I then came across a post from one of the leading voices in local SEO, Mike Blumenthal, over at Get Five Stars. After reading his post which says incentivizing clients to writes reviews is against the TOC of all review sites like Yelp and Google. I wanted to get clarification about creating draws and know if that is deemed as incentivizing. Mike confirmed that it was. @JordanJCaron a violation of TOS by review sites and FTC would likely want a disclaimer. So there you have it. Don’t create a draw like I had originally suggeted. Simply read the other posts on getting reviews I’ve linked to in this post and you’re all good.